Description: This painting has very strong allure. It draws you to it at first glance. 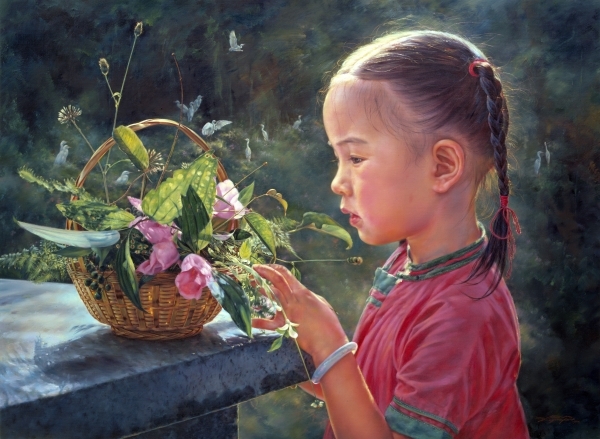 When you gaze at this piece, you will almost feel the warmth of the morning sunlight, smell the lush forest earth, hear the wing-beats of the Egrets and feel the serenity of the girl as she gazes at the bouquet of unspoiled nature. Set in the beautiful Isle of Maui, this piece truly generates the feeling of nature in harmony. A harmony that should be preserved and not exploited.